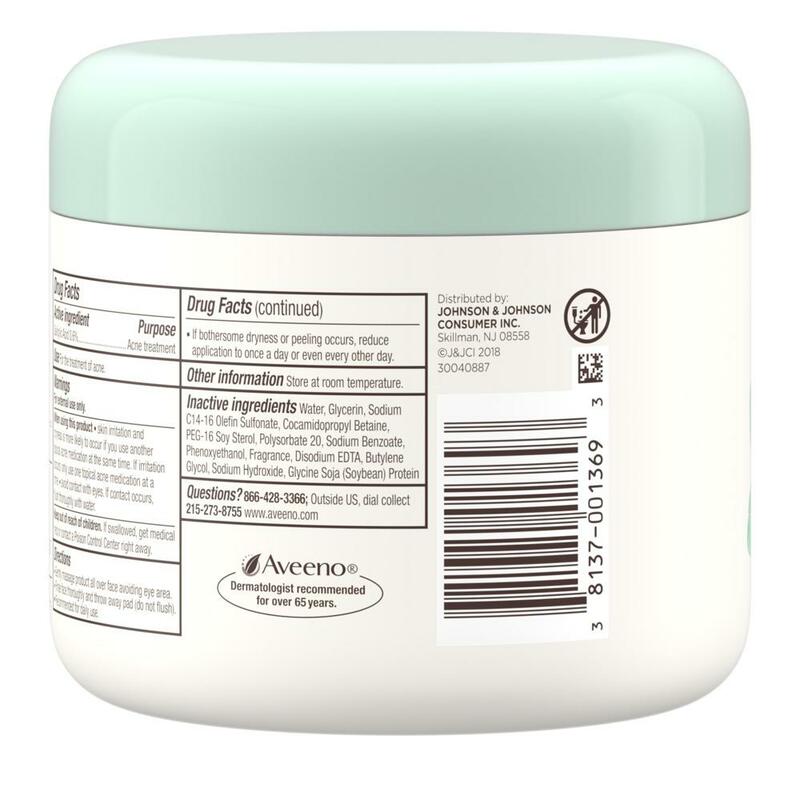 AVEENO® CLEAR COMPLEXION DAILY CLEANSING PADS is rated 3.1 out of 5 by 162. Clear up and prevent breakouts with these daily facial cleansing pads. Made with maximum strength acne medication and calming soy extract, this cleanser is designed to boost radiance and fight off blemishes without over-drying. It’s gentle enough for daily use and leaves your skin feeling calm, clear and rebalanced. Gently massage product all over face avoiding eye area. Rinse face thoroughly and throw away pad (do not flush). Recommended for daily use. If bothersome dryness or peeling occurs, reduce application to once a day or even every other day. For external use only. When using this product skin irritation and dryness is more likely to occur if you use another topical acne medication at the same time. If irritation occurs, only use one topical acne medication at a time. Avoid contact with eyes. If contact occurs, flush thoroughly with water. Keep out of reach of children. If swallowed, get medical help or contact a Poison Control Center right away. Traditional Chinese medicine has used soy for thousands of years to reduce the appearance of blotchiness and discoloration. 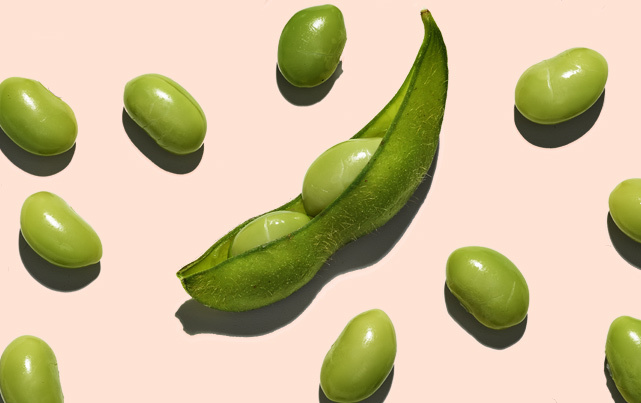 AVEENO® scientists devised a way to process soybeans that retains the integrity of the proteins to provide immediate and long-term skin benefits. Products with our Total Soy Complex visibly transform dull, uneven skin into brighter, more radiant skin. We recommend these great AVEENO® products to round out your daily skin wellness ritual. Enter your ZIP code to find nearby stores. Rated 1 out of 5 by Completely annoyed from DO NOT BUY - RASH/SKIN IRRITATION/BURNING *** I bought this product 4 days ago and used it for the first time that night. The following morning, my face felt so amazing I told three friends to go out and buy it. I used the pad again the following night and immediately started to notice my skin was itching. Like many others that have posted, I figured it was normal but woke up the next morning and my face felt sunburnt. Today, after not using the product for two whole days, I have red bumps, a rash, and burnt skin from my forehead down to my chest. I’m super itchy and don’t know what to do. I have been rubbing aloe on my face without any relief and my eyes are irritated. I wish I would have read the other reviews on here before buying. The past few days have been the absolute worst and I’m contemplating going to the ER because nothing is working and it is just getting worse. If you do still decide to buy the product, TEST IT ON A SMALL PART OF YOUR SKIN FIRST. Trust me, you do not want to waste your money or feel like this too. Rated 1 out of 5 by MJ143 from Burning Skin I had a horrible experience with the cleansing pads. After using them twice I woke up to a swollen, itchy, rah filled face. It feels as though my face is on fire, and by the looks of the other reviews NOTHING HAS BEEN DONE about this. I have no idea what to do to help with the itchiness and pain. STAY AWAY FROM THIS PRODUCT!!! You’re well aware something is wrong with this product, but yet you have continued to sell it. 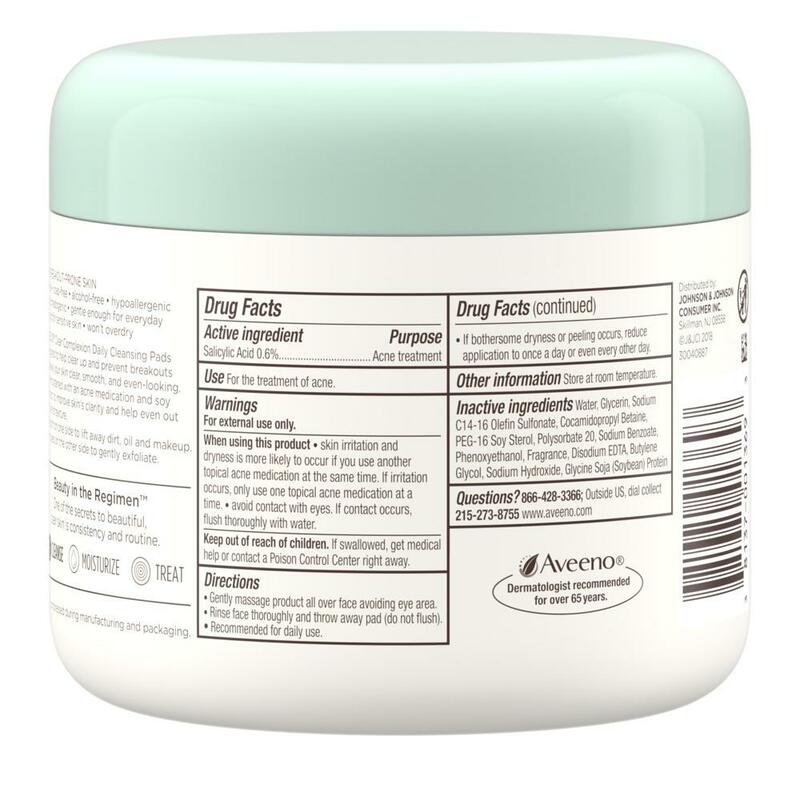 Rated 2 out of 5 by Tee95 from Caused my skin irritation I had bought this product last week, I’ve used it twice at night before bed after using the aveeno facial daily scrub to wash my face. The second use of the pad, my left cheek was starting to burn and was red with little blood patches (hard to describe *as if my skin was being scrubbed off* But a few days have passed and my skin has red patches of tiny bumps , i believe it’s irritation or allergic reaction (as i know i don’t have allergies to anything, but you never know) . It’s more so worse on my cheeks and forehead. Idk if it’s because i was using the coarse side of the pad too hard or the acne medicine it contains is too harsh on my face. Other than that, it smells nice , my face is glowing. Lol. Rated 5 out of 5 by Nicole1128 from My Favorite Skin Care Routine I have been hooked on Aveeno products for about 2 years and I can honestly say my skin has never looked better. I have always had acne prone skin and it has been extremely difficult to find something that made my skin clear. This is coming from a girl that before wouldn't dare step foot outside without makeup on regardless of where I was going to now I can go with work with a little brow makeup and mascara if I don't feel like putting on the full face. I have been having some difficulty finding these in stores here lately so I am really hoping these are not getting discontinued!! I feel bad for those with the bad review that have had such a horrible experience, but everyone needs to know that of course different products are going to affect people differently and this doesn't mean that this product needs to go away for everyone else. Please don't take these great cleansing pads away!! Rated 1 out of 5 by kamaeli from Aveeno what the heck? I bought this yesterday, my face is swollen and red and rash and I have he lumps on my skin. This product is supposed to be for sensitive skin yet I'm suffering. MY SKIN IS ON FIRE. I would like my money back. I might have to go to the emergency room due to this facial rash and irritation. Thats ridiculous on so many levels, better your product because my skin looks how it feels. I wish I could include pictures of some sort. PLEASE DONT BUY THIS PRODUCT IF YOU DONT WANT EXTREME PAIN. Rated 5 out of 5 by AusTXGal from I love these cleansing pads! I have been using these cleansing pads ever since they came out. I love how clean and smooth my face feels! I wear longwearing makeup that is difficult to remove. I hope Aveeno keeps making this forever! Rated 1 out of 5 by Tisky31 from Do NOT use! Chemical burns on my face I bought this product 3 days ago (3/11/2019) and used it 1 time. I started noticing some itching before bed. I woke up the next morning with severe itchiness, red hives, and what felt like a burn. Today (3/14/2019), my face isn’t any better. I’ve tried everything I know to get relief, I’m even treating my face with burn cream. Aveeno I, I’ve read the same types of reviews from a year ago, yet your product is still sold on storefront shelves. Why!!!? Seems like a lawsuit may be in order. Do something! Take this product off the shelves and stop being the cause of hurting women or men. I can’t put make up on or even leave my house comfortably because of how it feels and how I look. © J&JCI 2019. All rights reserved. This site is published by Johnson & Johnson Consumer Inc., which is solely responsible for its contents. This website is intended for visitors from the U.S.